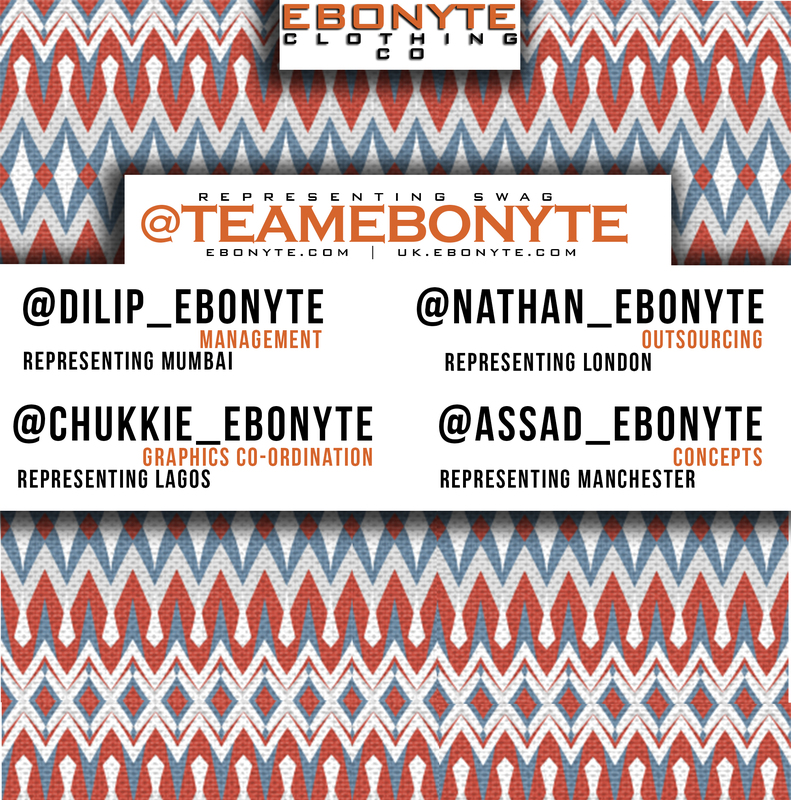 … add Dilip Suthar, Assad Saeed and Nathan Fajebe and you’ve got – Teamebonyte – The council (Founding Members). Im an Ibo Nigerian, Dilip is a Marwadi Indian, Assad is a Muslim Pakistani and Nathan is a Yoruba Nigerian. Ebonyte is used to mean Self esteem beyond classification, what led up to “ebonyte” were the issues we faced individually – always being classified as not enough. This is an issue that still goes on today among people – stereotypes/classification. As most Nigerians, Pakistanis or Indians would tell you this – the dividing line between peoples keeps getting bigger everyday, We aim to use our ideas, implementation and apparel to correct that impression, this is the core idea behind everything that bears the name – “EBONYTE”. “represent” is the way we identify ourselves, if u were to see the next man wearing an Ebonyte tee :- He’s representing where his from and His mindset about classification. We are a clothing company with purpose and intention, if our apparel isn’t your style, keep faith we’ve got so much to offer or you can always support or learn about, contribute to and enlighten more about – the cause, which is EQUALITY. Reblogged this on The Ebonyte Blog .